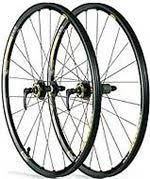 Handbuilt Wheels - Pair Non Disc - Custom Wheels - Non Disc: "Pair handbuilt wheels. Base price is for a Pair of Deore hubs with a Mavic XM317 rims and ACI stainless steel double butted spokes. You can choose to upgrade the hubs, rims and spokes from the drop down list. Please note all wheels are handbuilt for each order, please allow build time. These wheels are non disc.Select your requirements from the upgrades and the price will automatically adjust. Please allow 5-8 days build time. Please note: As 50% of the wheel costs are incurred within the labour charges to handbuild it, if you change or cancel a wheel order this cost will be deducted from any refund."